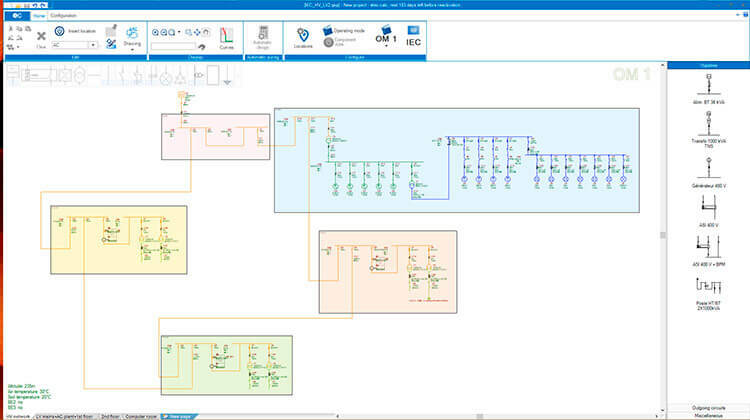 elec calc™ allows the user to draw the one-line diagram very quickly using drag / drop from the component distributor. These components come from the generic base provided with the software but can also be customized according to the project. The software has a positioning grid (that can be disabled), the components have intelligent connection points, keyboard shortcuts help duplication of all or part of the installation. elec calc™ enables the user to store in a personal library parts of installation that can be reused in various projects by drag / drop. All customizations of a project can be saved in a template that can be reused for another project. The electrical installation can be drawn on several tabs that are “electrically” interconnected. The “Link” component enables to connect parts of the installation on the same or several tabs. The different parts of the installation can be highlighted by using the contours related to the locations. The user can customize the color of the networks downstream any source to show the different voltage levels of the installation. 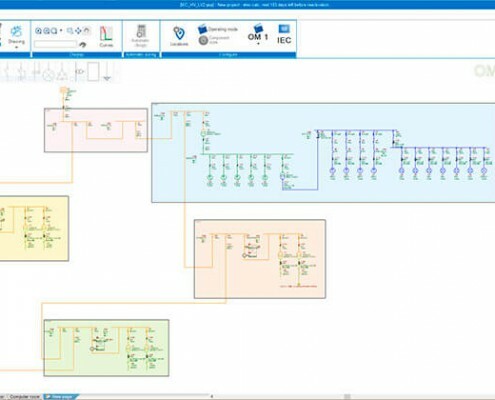 The one-line diagram is then drawn in a both intuitive and assisted way enabling significant time savings, with an unprecedented quality of presentation. The one-line diagram can be printed or exported to the PDF or DWG format either on a single drawing or in the form of folios. The foliation can be easily modified by the user. It can then be completed with the help of a CAD tool.